Precious metals prices are down Thursday despite geopolitical factors calming a bit this week. While rising government bond yields have created downward pressure on precious metals markets, it seems there may be relief in the near future. The worlds stock markets have been all over the place this week. Eventually the longest equity market bull run in history will come to an end, the ballon has to burst, or at least lose some air. Precious metals will be the the benefactor of the world markets coming back down to Earth. Historically, precious metals markets react inversely to the value of the U.S. Dollar. That is, as a safe haven asset, precious metals will usually go up when the dollar goes down and vice versa. However, this week was a frustrating week for precious metals market watchers. Despite the U.S. Dollar Index hitting 7-month lows, precious metals failed to react higher. 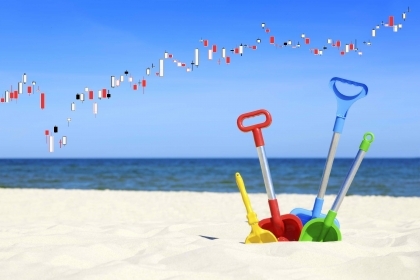 I believe that most investors attention is either on Summer Vacation or on major equity markets right now, which is leading to a delayed reaction in precious metals markets. Until there is significant movement in world equity markets I would expect precious metals to continue to trade in the same range they have for the last few months. The plus side for investors in metals is that you can continue to buy metals at low spot prices. Combined with the doldrums of the summer months and a fairly stagnant precious metals market overall, premiums over spot have fallen drastically. We have seen this before. Two summers ago, we had low premiums and silver bottomed out in early May in the $13-$14 per ounce range. WIthin two months, silver rallied to almost $20 an ounce and premiums over spot skyrocketed to almost 40%-50% in some cases. It will happen again, and conditions are perfect for it. Usually when premiums AND prices are this low, most investors don't pay attention. But this is exactly the time to take advantage of precious metals markets. When the market does turn, it will move fast and so will premiums. Keep any eye on the markets and beware of your equities portfolio. The turnaround is just around the corner.